Momentum has said it will back calls for the process of selecting Labour election candidates to be "opened up", at the party's conference this month.The Jeremy Corbyn-supporting campaign group said it wanted to see a "new generation" of Labour MPs.The group backs mandatory reselection, which would see activists able to challenge sitting MPs rather than see them renominated by party branches.Centrist MPs fear the idea is aimed at purging them from the party.Two MPs on the right of the party - Frank Field and John Woodcock - have quit the whip in recent times complaining of a culture of bullying and intimidation in the party. Those on the left say they are out of step with the direction of the party and point to the fact Mr Field lost a vote of confidence among members of his local constituency party in Birkenhead in July. 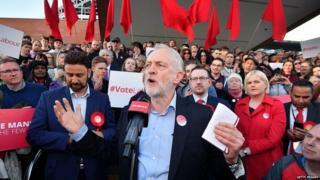 Can Labour detoxify the anti-Semitism rowThe sanction has been in place since the 1980s when Labour was fighting entryism by the hard-left Militant group. The paper said five local branches so far had expressed support for it being removed. Most of the focus, however, will be on demands for mandatory reselection, where local members will be given the opportunity to to choose from a shortlist of candidates, including the sitting MP. At the moment, the vast majority of incumbent MPs are reselected if they get the backing of a simple majority of constituency party members.Momentum said there was a "groundswell" of support from among its members for this system to change and for there to be a "level-playing field" between different candidates. "Labour has to nurture the talent of its half a million members and we cannot let an outdated rulebook hold back a new generation of MPs," it said in a statement. "Labour's selection procedure should be democratic, give a fair chance to all candidates and encourage positive campaigning. This means ending the divisive practise of forcing activists to campaign against sitting MPs and replacing it with a process that is open from the start. "Opening up the selection process will create a more level playing field between candidates. "The vast majority of MPs oppose mandatory reselection, believing the demands are politically motivated.The conference is expected to discuss the findings of a "democracy review" commissioned by Jeremy Corbyn in 2016, including into the rules for future leadership contests. But the question of mandatory reselection was not part of taskforce's remit.